"Take Some Time to Learn First Aid and CPR. It Saves lives, and it Works." It is Worth the Time to Take as Quality a Wilderness First Aid Course. It is very likely to save your life or one of your wilderness travelling companions lives some day. I highly Recommend either a 40 hour or an 80 hour Wilderness First Aid Course. Take the time it is really worth it. I highly recommend these two companies having taken Wilderness First Aid courses from them. I have found their instruction very professional and their courses worth both the time and money. Wilderness First Aid Training is a Fundamental Wilderness Trekking & Survival Skill. Any type of first aid training can be a life saving skill, but Wilderness First Aid Training teaches you what to do when you are beyond the one hour to hospital tether. These skills are extremely important to any wilderness traveller. Don't take chances, take a wilderness first aid course before you travel into the wilderness. 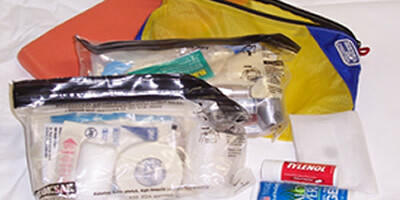 Many companies and first aid organizations produce or sell first aid equipment. Some produced or sell gear that is superior to the others. These four dealers produced excellent equipment and kits worth purchasing. If you are building your own kit try starting with Adventure Medical Kits replacement packages as they are far cheaper than their pre-made kits.